Photo by Riah Roe. 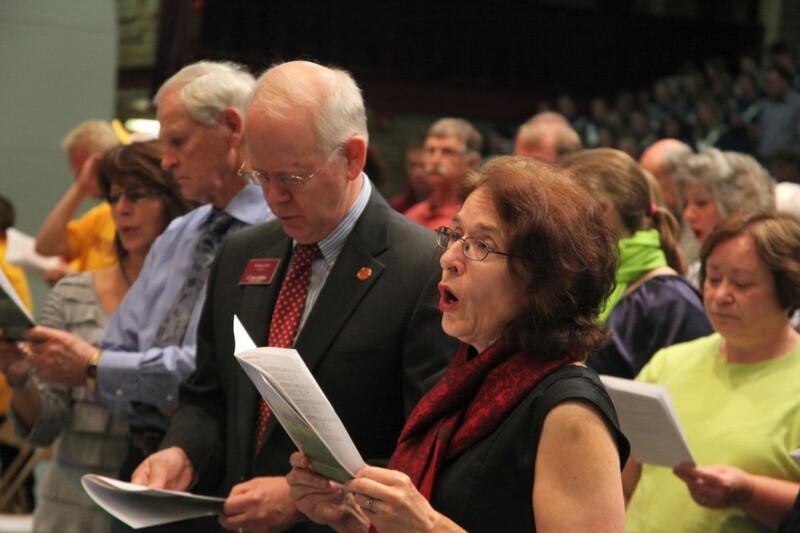 President William Craft and his wife Anne sing along during the Family Weekend All Campus Worship on Sept. 25th. They say that behind every great man is a great woman, but when it comes to the Crafts, Anne stands by the president’s side. Not only does she support her husband, President William Craft’s new job and all that entails, but she also has taken her own steps to connect with the students and community. While William’s transition to Concordia College has been a busy one, Anne has also needed to adjust to being the first lady. At Luther College in Decorah, Iowa, where the couple moved from this July, William was the dean and vice president of academic affairs, and Anne worked in an office similar to Concordia’s Academic Enhancement and Writing Center, where she worked with students on study skills, taught reading and ran the tutoring program. As a way to get involved on campus, Anne has been volunteering her time to the AEWC by helping hire and train new tutors. “It’s a way for me to get to know the students and get connected,” Anne said. Troy Schmidt, the AEWC tutoring program coordinator, is glad to have her on board with the increasing demand for tutors this semester. Photo by Riah Roe. 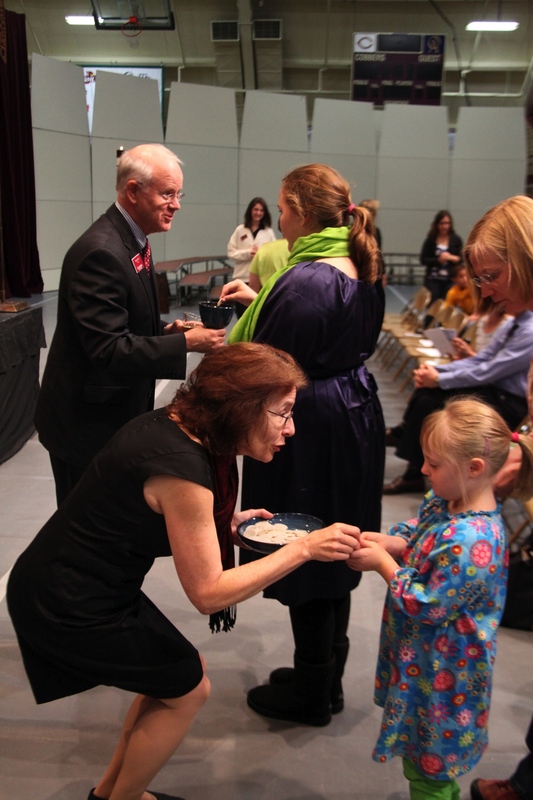 President William Craft and his wife, Anne, distribute Communion to worshippers at the Family Weekend All Campus Worship Service on Sept. 25. Anne has found her own niche on campus through the Academic Enhancement and Writing Center, where she volunteers her time. Even when Anne is not helping train or hire tutors, the Crafts have dropped into the office in the evening to drop off brownies and say hello to the students. Although the beginning of the school year includes countless speaking engagements and events for the president, the pair has worked as a team to acquaint themselves to the college and community. William said that being president is much different than his position at Luther, because there are more obligations that are scheduled into the evenings and weekends. However, the couple enjoys them and how connected they have become to the community. William and Anne were both born and raised in New Wilmington, Pa., where they attended the same church. Since getting married, they have lived in Chapel Hill, N.C., and Gettysburg, Pa., where William has worked his way up the ranks of university positions, and Anne has edited books, taught high school and college classes and worked in college administration. She said that one of her favorite things about the beginning of the year thus far has been all of the opportunities to watch William speak in public. “He is just so eloquent, as you can tell,” she said. One of her favorite events so far, among many, was inviting the new students into their home for the ice cream social during orientation week. The Crafts have two children living in Iowa and Boston that have been unable to visit their new home in Moorhead yet. The next few weeks will continue to be busy for the couple, as Homecoming is fast approaching. However, if the beginning of the year is any indication, they will be at ease and enjoy the many activities.